Domestic travel restrictions – Please help us spread the word so that NO ONE misses their flight(s) in 2018! If you are from these states you will not be allowed to travel domestically after January 22, 2018 (by air) unless you go through another step or two BEFORE leaving for the airport. Did you know that after January 22, 2018, PEOPLE FROM 9 STATES will not be allowed on flights or past TSA security without a passport or other form of I.D.? We are concerned that people are going to buy tickets or have layovers and leave the airport in these states and not knoiw about these domestic travel restrictions or be able to pass TSA security, missing their flights and creating all kinds of chaos/grief (over missed flights, lost money on tickets, missed work, and more). – Not being allowed to check in and board your plane. 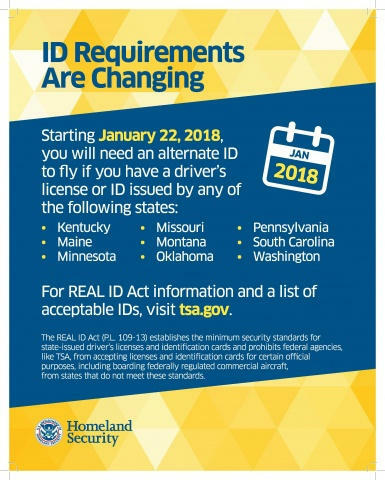 Every traveler will need a REAL ID-compliant license or state ID or another acceptable form of identification to fly within the U.S.
See a REAL ID driver’s license below (story continues after image). What s a REAL ID drivers license? It looks just like a regular driver’s license but has a small gold star in the top right corner. If your driver’s license DOES NOT have a small gold star in the top right corner, your driver’s license is not acceptable for flying domestically. What makes things more complicated is that many states are issuing both new driver’s licenses AND new REAL ID driver’s licenses. If you don’t ask (and pay the small additional fee and go through the few extra steps), then your new updated driver’s license will still not help you if you want to catch a flight within the USA. This is problematic because the majority of Americans do not have a current passport. Or REAL ID driver’s license. So we are asking you to PLEASE HELP US SPREAD THE WORD. Tell others. Share this post. Take this test. 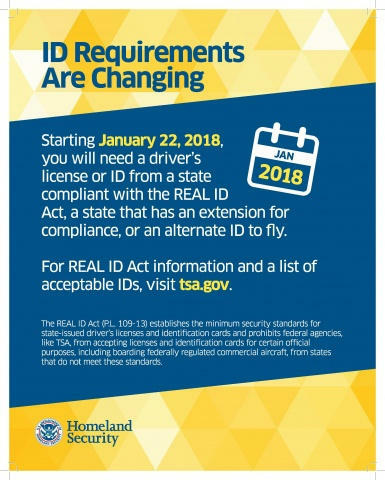 Ask one other person today if they have heard about not being able to fly (in the states) starting in 2018, without a special drivers license or passport. See what they say. Our guess is that the majority of people will be shocked, not believe you, not know anything about it. SO WE NEED YOUR HELP TELLING EVERYONE. Because we anticipate the frustration and anger over missing flights, weddings, work, important meetings, and not being allowed to fly until new documents can be sent to you! We’ve written about this subject now at least twice since the law went into effect. But everyday we meet people who haven’t heard of it, who do not know what we are talking about. Imagine a new spouse not being allowed to fly for her honeymoon? What about if I live in another state? What domestic travel restrictions will I face? 1.) You should check here for your particular state. 2.) You should update your Drivers License to a Real ID version as soon as possible (so you don’t forget). 3.) 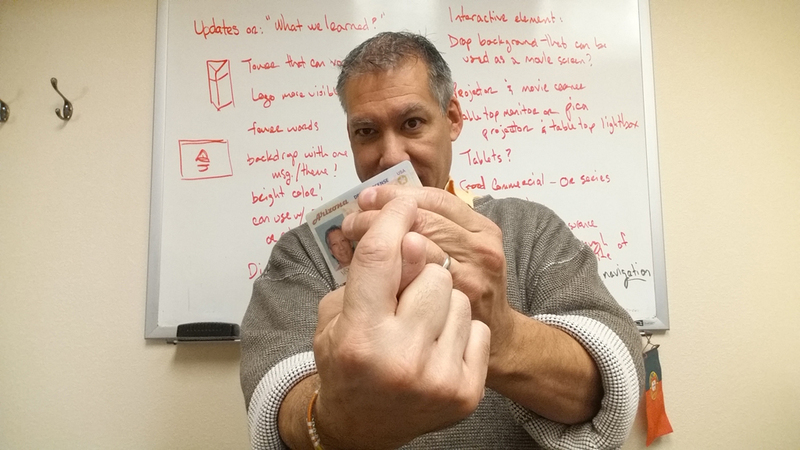 Figure out what documentation you need before applying for a REAL ID driver’s license. 3.) You can write a complaint letter to the Department of Homeland Security if it might make you feel better. 4.) You can learn more about the law BEFORE you need to fly (give yourself enough time before your flight). – We have an article explaining things including official links here, From Jan, 2016 (updated). – and from 2017, here. We wish that states would only be issuing new REAL ID drivers licenses to everyone. Rather than two different forms of driver’s license (with Non-REAL ID being the default. We think this is going to further create problems and confusion. That is why we continue to speak out about this issue and do our best to educate everyone. Because we look out for travelers, keeping them safe. BTW, did you know we can also insure you for emergency medical insurance domestically if your insurance and network do not cover where you are headed domestically, or internationally? It’s very affordable at only $1-2. a day including emergency evacuation! While the Transportation Security Administration does not require children under 18 to travel with a photo ID, some airlines may require proof of age upon check-in. Bring your child’s birth certificate, or a copy of it, for smooth travels at the airport. This will prove your child’s age to airline personnel upon check-in. You should also contact your airline ahead of time to ask if a birth certificate or other ID is required for your children. Minors arriving at domestic locations need to be met by an adult. That adult will need to provide photo identification when entering the airport, just like an air passenger would. When your child is returning home, the adult dropping a child off at a departure location will be required to show a photo ID. More about children traveling alone here. Want to know more about domestic travel restrictions and REAL ID? More from the U.S. State Department. More from the Department of Homeland Security. Check with your local state’s Department of Motor Vehicles. Q: At what point in the application process should states capture the applicant’s image? Q: Does the REAL ID Act require an applicant who wears a head covering for religious reasons to alter or remove the head covering so that the driver’s license or identification card photograph shows their hair or ears? Q: Does an applicant have to provide documentation of all previous names if the name on the identity source documents – e.g., birth certificate – is different from the current legal name that will be displayed on the new license or identification card to be issued? Q: What classifications of aliens are eligible for full-term compliant driver’s licenses? Q: Occasionally an alien may present a document that on its face has an expiration date that has already passed, yet the document has been extended by DHS and should be regarded as unexpired. Can a state accept a document under these circumstances? Q: Can a “Temporary” or “Limited Term” license be renewed remotely? Q: How should a “Temporary” or “Limited Term” license be marked? Q: What is the purpose of an exceptions process? Q: Should states inform DHS when they change their exception process? Q: Should states have an independent laboratory assess the physical security features of their driver’s licenses or identification cards? Q: How should states mark compliant and non-compliant licenses so that screeners can easily distinguish between acceptable and unacceptable state-issued driver’s licenses or identification cards? Q: Upon renewal do applicants need to re-submit any documents that were required at the time of the initial application? Q: What would be considered a material change in Personally Identifiable Information (PII)? Q: May states issue a duplicate REAL ID remotely? Q: If a state has already copied an individual’s identity source documents, social security information, and proof of address prior to full compliance, does the individual need to re-submit those same documents when applying for a compliant license for the first time? Q: New York, Vermont, Michigan, Minnesota and Washington currently issue “enhanced driver’s licenses” (EDLs) that are designated by the Secretary of Homeland Security as acceptable to enter the United States at land and sea ports of entry in accordance with the Western Hemisphere Travel Initiative (WHTI). Are EDLs acceptable for official federal purposes such as boarding a commercial aircraft?